First impressions are everything – especially when it comes to selling your home. Your home’s curb appeal can make or break a home sale. Did you know that 63 percent of homebuyers will drop by after viewing a home they like online (according to the National Association of Realtors)? So, does your home have a sparkling outside, or does it look more like a haunted house? Your curb appeal serves as just a preview of what’s to come when potential buyers enter your home. Yep, it’s as easy as that! Painting your front door can instantly add some brightness and life to your home. Pick a bold color that will make your home stand out, but make sure the color will match the rest of the home. A gallon of exterior paint costs about $30, so this is definitely one of the easiest/cheapest ways to transform your curb appeal! Fall is a great time to sell your home because there are fewer competitors, but still an active market! 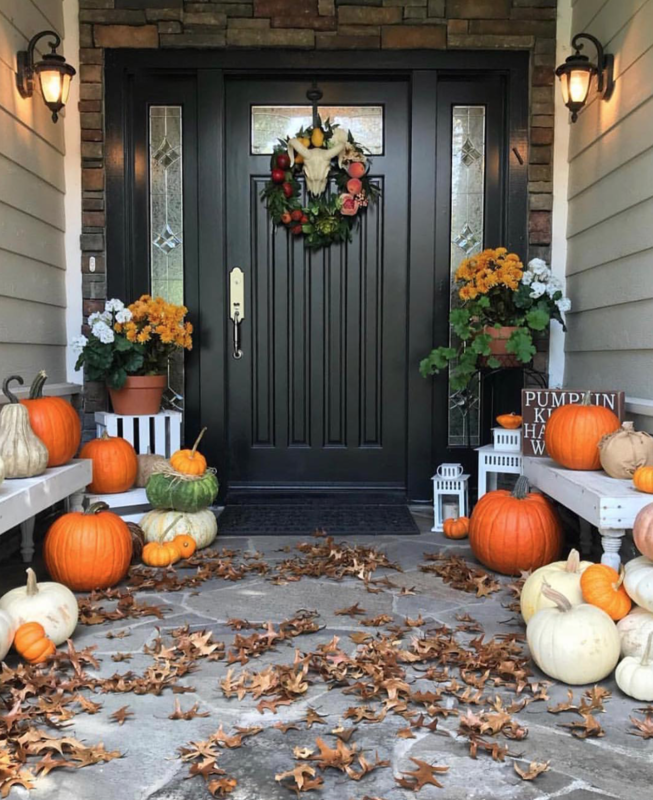 But instead of decorating your home like an actual haunted house with fake spider webs, zombies and monsters – aim for something a little less creepy. Fall colors, leaves and pumpkins are great decorations for fall. Are your current house numbers faded? Is one missing? Are they even visible? Put up some new numbers to boost your curb appeal. A design trend right now is big, bold numbers. Wooden shutters are a spooktacular was to enhance the exterior of your home. To warm up the color palette of the outside of your home, you can use a dark wood stain. Or if you’re feeling bold, you can paint them an eye-catching color. Just make sure it goes with your current color scheme! Properly lighting the exterior of your home has the potential to change the look of the entire place! If your home is poorly lit, you could be spooking away potential buyers. Replace the exterior light fixtures of your home with new, stylish and functioning lights. You’ll want to light up the entryway of your home and the landscape surrounding your home. This might be the easiest way to brighten up your home’s curb appeal. If your home is lacking color, add flower boxes and potted plants around your home. You can install the flower boxes on the porch railing and below the windows. Place potted plants on your front steps of porch and boom – your home no longer looks like a haunted house! Want to sell your home but you’re not sure where to even start? That’s what we’re here for! Contact us today and we’ll get you set up with one of our awesome realtors. We make selling your home SCARY easy. Blog cover photo via @countrylivingmag on Instagram.